"The Parmesan cheese adds a nice Italian touch to this meal-and crème fraiche gives it a rich, creamy texture. 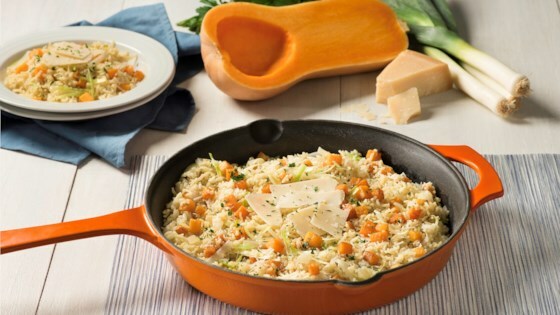 This may be the most delectable way you've ever enjoyed butternut squash!" In a 9-inch saute pan, heat butter over medium heat, adding squash, garlic, onions, and leeks. Saute about 3 minutes until onions are translucent. Stir in UNCLE BEN'S(R) Flavor Infusions Parmesan & Butter Rice and water.